Presentations are free of charge to all Montana schools. Please keep in mind that schools more than four hours away from Bozeman should be able to gather at least one hundred students for a presentation. Feel free to download and use these images in your classroom! NASA News and Events: Stay up to date with NASA updates. NASA for Educators: NASA related resources for educators (K-12) looking for NASA related classroom material. NASA's Eyes on the Solar System: (K-12) Download this free, easy-to-use app from NASA to explore the Solar System with your classroom. This app is basically Google Earth, but in space! The app includes trajectories and information about current probes that are exploring our Solar System. The Juno mission will remain active until February 2018 when the probe will deorbit into Jupiter. Stay up to date with the project and learn about new Jupiter details on the Juno Mission website. Did you have a good time looking at the Eclipse? Looking for eclipse related lesson plans? 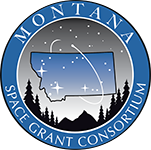 Check out these lesson plans created by pre-service undergraduate students for the Great American Eclispe as part of Montana Space Grant's PSEEC project (Pre-Service Educator Eclipse Competion). These lesson plans integrate NGSS with NASA's 5E model to create a diverse approach to eclipse education. Check out NASA's official eclipse page where you will find access to all kinds of resources in preparation for the Great American Eclipse! See and stay up to date with our star, the Sun, like you never have before with NASA's Helioviewer. This Google Earth-like viewer will allow you to observe our star in your classroom like never before! Interact with and expand your understanding of the 2017 eclipse using NASA's Eyes on the 2017 Eclipse. Explore your view fo the 2017 eclipse and other astronomical events from your location using the free interactive planetarium software Stellarium. Stellarium is a free open source planetarium for your computer. It shows a realistic sky in 3D, just like what you see with the naked eye, binoculars or a telescope. Download Stellarium for free here! These teacher tested activities are very helpful and complement Montana's science curriculum very well. Looking for ways to improve Science Education, and get paid for it?! Check out this great opportunity! Looking for more educational content that's happening right here on Earth? Free educational content can be found on Terra's website that has been produced right here in Montana! The following are astrobiology and STEM (science, technology, engineering & math) related activities for grades K-5. They can be used in any classroom, museum, summer camp, or even at home. How can we find out if aliens exist? What is it like to be an astronaut? Is Moon dirt different than Earth dirt? Would Mars be a good place to visit? Why is NASA studying Yellowstone? Do animals have their own language? Clicking on the appropriate grade level next to the show that you have requested will take you to the page with the material that is most relevent. Most of the files are PDF's. If you are unable to open PDF files free software can be found here. Feel free to contact us if you have any problems with the downloads.